By now, you have probably heard about the surprise homecoming of an army soldier in Fayetteville, North Carolina. Antonio Rodriguez of the 82nd Airborne Division returned home early from a deployment in Afghanistan and decided to surprise his family, including his pregnant wife, at their local Chick-fil-A. Antonio dressed up in the Cow mascot costume and surprised everyone when they posed for a picture with him. Since then, this heartwarming story has gone viral and was even featured on The Today Show. But how did it all come together? Chick-fil-A has the inside story. How long had the surprise been in the works? Antonio first called his father, Michael Rodriguez, in December to let him know that he was coming home early and would be there to see the birth of his first child, who is due in March. It was then that Michael knew he had to do something special. Michael and Antonio then had to keep the secret until they knew the exact date of Antonio’s return. How did Chick-fil-A get involved? 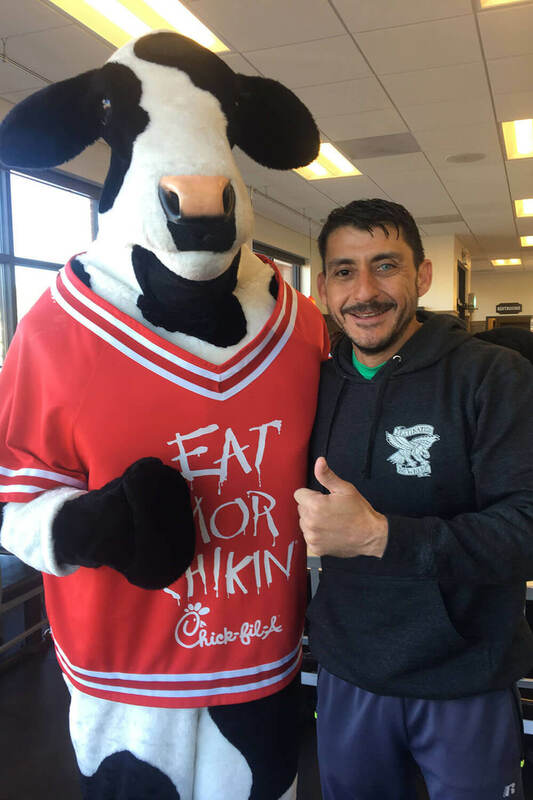 Chick-fil-A is one of the Rodriguez family’s favorite restaurants, so Michael didn’t think it would be suspicious if he suggested everyone meet for lunch, where Antonio would be waiting to surprise them. But simply showing up to see Antonio wasn’t enough. “Everybody loves the Cow Mascot, and disguising Antonio in the costume just seemed perfect for us,” Michael said. How did the plan come together? Antonio got confirmation that he would be back home the last week of January. He landed late at night, and stayed at his father’s house in order to keep the surprise. In the morning, Antonio went to the Chick-fil-A early to practice putting on and removing the Cow costume. When the family arrived, Antonio was already playing the part of the Cow, handing out Plush Cows to kids and taking photos with them. “When everyone got there, I said, ‘Hey, let’s get a picture with the Cow,” Michael explained. While taking the picture, Antonio took off the costume and surprised his wife and the rest of his family.